When Trader Joe’s introduced cauliflower gnocchi to their stores, it immediately became a weekly staple in our household. Our freezer almost never doesn’t have a bag because it’s honestly just that good. It cooks up so easily, it tastes delicious, it’s relatively healthy and you don’t need to do a whole lot to transform it into a complete meal. Case in point, the recipe featured in this episode of The Cooking Couple. This one-pan gnocchi and sauce is our favorite way to enjoy this pasta because it reminds us of one of our favorite dishes from one of our favorite spots (Frankie’s) in our old neighborhood in Brooklyn (Annnnd who thinks I didn’t say “favorite” enough in that sentence?!). It tastes totally decadent and creamy, like the ultimate comfort food, but, fun fact, there’s no cream in site (the creaminess actually comes from the starch in the gnocchi). Instead, there are just a few simple ingredients, all of which you probably either have on hand or can easily find at Trader Joe’s. Oh, and did I mention this all comes together in one pan and under 15 minutes? Yeah, you’ll definitely want to be filing this under “Dinners To Make in a Pinch”. To pair with this dish, Dave threw together one of our favorite go-to cocktails, what he has dubbed “An Italian in Mexico” (you can find out why below). It comes together just as quickly and as easily as the meal, and it is the perfect sweet and smoky match to the creamy, spicy tomato sauce find in the gnocchi. 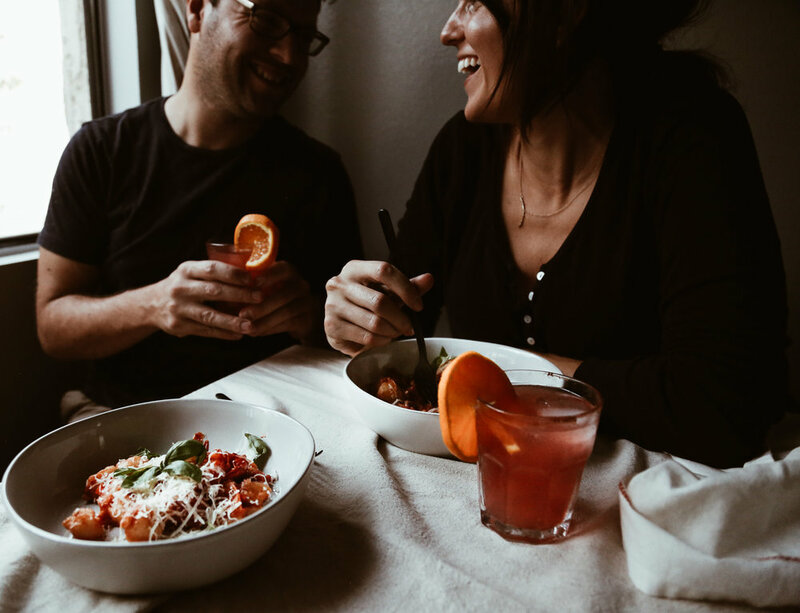 Cheers to easy cocktails, Trader Joe’s hacks, simple dinners and fun meals you can easily throw together with a loved one or a friend! Place a large skillet over medium heat. Add a generous drizzle of olive oil and allow it to heat for about 60 seconds. Add the garlic and sauté for 30 seconds, before tossing in the tomatoes and, if you want a spicy sauce, a pinch or two of chili flakes or a few calabrian chili peppers. Cook for about 8-10 minutes, stirring constantly, until the tomatoes begin to burst and form a bit of a sauce. If the tomatoes are browning or cooking too fast, turn the heat down to low. If they are drying up, add a splash or two of water. Once a sauce has started to form, add in the gnocchi, sprinkle with a touch of salt and stir to combine. Continue cooking for another 6-8 minutes, stirring every so often, until the gnocchi are heated through and well coated with the sauce. Similarly to the sauce dilemma above, if the gnocchi start to stick to the pan, or the sauce starts to dry up a bit, just add a splash of water, or even olive oil. Season with additional salt, as needed, then serve and garnish with your choice of toppings (I like mine with fresh basil, lots of parm and sometimes a few extra chili flakes for an extra spicy bite! ).